Näituse teemaks on valguse kui metafoori ja valguse kui illumineeriva impulsi vahekord. Näitusel osalevad kunstnikud ja teosed kõnetavad valguse, psühhogeograafia ja psühhedeelia seost. Lisaks saavad kõik näituse külastajad nautida Brion Gysin’i poolt 1959. aastal leiutatud ning William Burroughs’i ja Psychic TV poolt populariseeritud legendaarset hallutsinatsioone esile kutsuvat Dreamachine’i ehk Unenäomasinat, mida esitletakse Eestis TAVA2018 raames esmakordselt. Näitus toimub samaaegselt Tartu Kunstimajas ja galeriis Noorus. Näitus avatakse kell 17.00 Tartu Kunstimajas ja kell 18.00 galeriis Noorus. TAVA2018 kõrvalprogrammi raames liigutakse avamistega kell 19.00 Kogo galeriisse Kristi Kongi ja Mari-Leen Kiipli duonäitusele “Salajane vilin metsas”. Avamiste õhtu lõpetab näituse “Vaakum kui mõtteviis” peaesineja Carl Michael von Hausswolffi kontsert Aparaaditehase Armastuse saalis kell 21.00. The subject of the exhibition is interaction between light as a metaphor and light as an illuminating impulse. Artists and works that participate at the exhibition deal with the link between light, psychogeography and psychedelia. Also, the legendary Dreamachine, a device causing hallucinations, invented by Brion Gysin in 1959 and made popular by William Burroughs and Psychic TV, will be presented for the first time in Estonia. 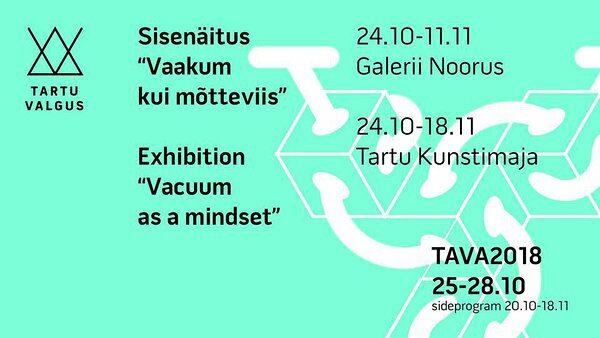 The exhibition will take place simultaneously at Tartu Art House and gallery Noorus. It will be opened at 5 PM at Tartu Art House and at 6 PM at Noorus Gallery. The string of openings of TAVA2018 will continue with the opening of a side program at 7 PM at Kogo Gallery – Kristi Kongi’s and Mari-Leen Kiipli’s duo exhibition „Secret Whistle in the Forest“. After the openings everyone is expected at the Widget Factory (Aparaaditehas), Hall of Love (Armastuse saal), where starting from 9 PM you can enjoy a live concert “…something drone and strange!! !” by Carl Michael von Hausswolff, the main artist of „Vacuum as a Mindset“. NB! A special bus will be taking people from Tallinn to the opening of the exhibitions and the concert. The bus leaves from the centre of Tallinn on October 24 at 2.15 PM and heads back to the capital at 10.30 PM. The cost for the round trip is 10 Euros. To get a seat on the bus, please register at buss@kogogallery.ee before October 20.